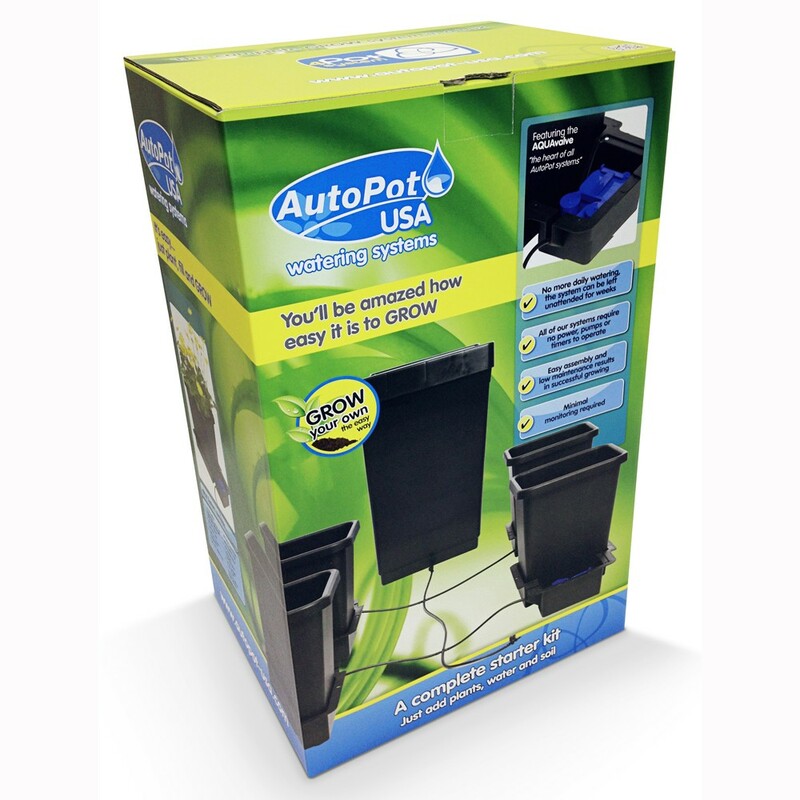 The superb AutoPot System lets you produce a small collection of stellar plants in separate growing containers that are each part of a very effective, completely automated watering network. 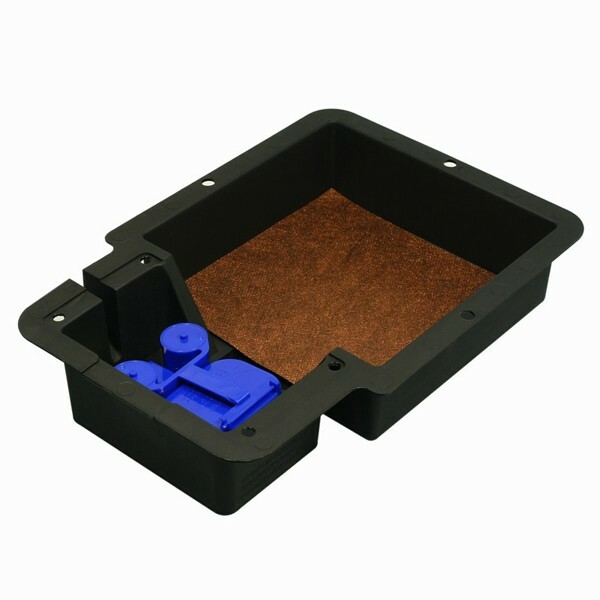 By being able to distribute feeds precisely when your plants need them and without using a pump or timer, this smart little set up really does help save you huge amounts of time, effort and money. 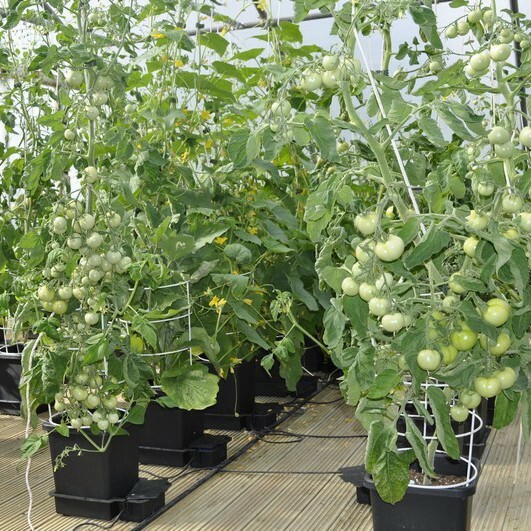 Suitable for hydroponics, coco and soil media (mineral feeds only) in greenhouses and grow rooms, the AutoPot System proves to be pleasingly easy to manage and maintain! You start off by potting up your plants and then water them through, allowing them to establish for a period of 7-10 days before turning on your system. From here onwards, nutrient solution in the reservoir is gravity-fed to pots – which all incorporate the fantastic AQUAvalve component to only release this feed-enriched water when plants require it. Your plants will respond favourably to this process, and as they grow and expand in size, the movable pots can be handily repositioned if necessary to find more space for further development. Fantastic! Once you have emptied the box that the system comes in, check to make sure all of the equipment is present. Refer to the ‘kit contents’ panel for a full list of parts. 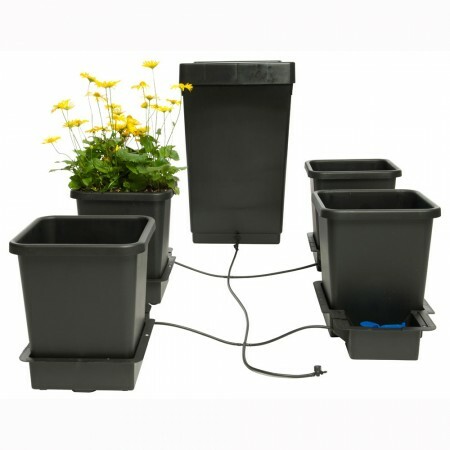 Decide where you would like the 47 litre tank and 4 x 15 litre plant pots to go in your room. Conveniently the system can be arranged so that the pots either run in a line or from part of a grid. The tank needs to sit at least six inches higher up off the ground than the plant pots in order to guarantee that there is sufficient gravity pressure. Once in place, insert the 6mm Top Hat Grommet into the hole at the bottom of the tank, then thread the 6mm pipe through this so that there is roughly an inch of it inside the tank and finally push the 6mm Golf Filter into the end of the pipe. Using a pair of scissors cut the pipe a couple of inches from the point it emerges from the tank and insert a 6mm In-line Tap. 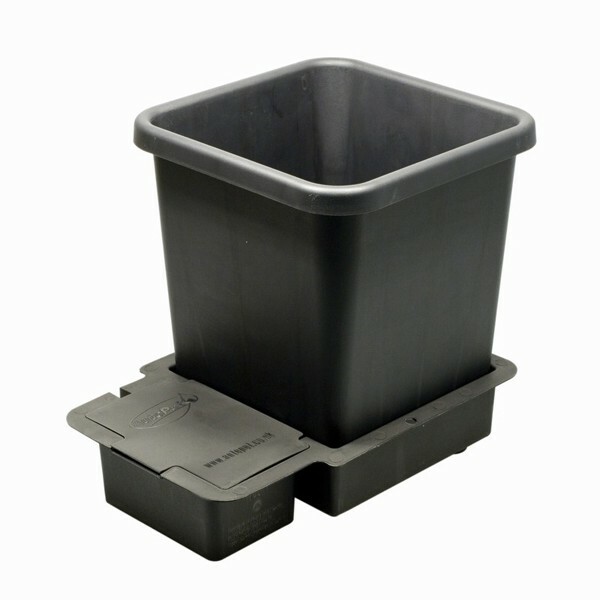 For the individual plant pots, position each of the trays as desired, then place a Root Control Disc (which prevents roots from escaping) gold face down in the larger section of the tray, and rest the AQUAvalve in the smaller section of the tray so that the outlet faces the insert in the plastic. You should add the pots and AQUAvalve cover at the end of the installation process. Take the length of 6mm pipe coming from the 47 litre tank and run it past the pots. Cut the pipe at the sections where you plan on branching off to the pots and attach the required 6mm Tees or 6mm Cross Connectors (depending on your system layout). 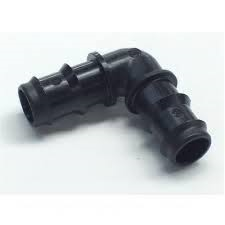 Bridge the gap from the tees/cross connectors to the pots by cutting small pieces of pipe away from the end of the main line, then for each tee/cross connector push one end of a piece of pipe over the available outlet and run the other up to the outlet of each AQUAvalve. Lift up each AQUAvalve and remove the collar, thread the pipe through it and attach to the nozzle, then retighten the collar. 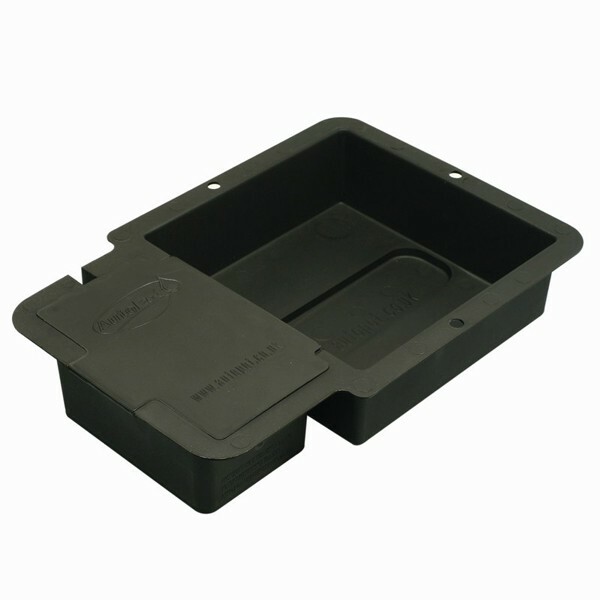 Attach each AQUAvalve to the t-section on the respective tray to stop them from floating when the system is live and then cover them with a lid. Finally insert the second 6mm In-line Tap at the end of the main line of pipe. 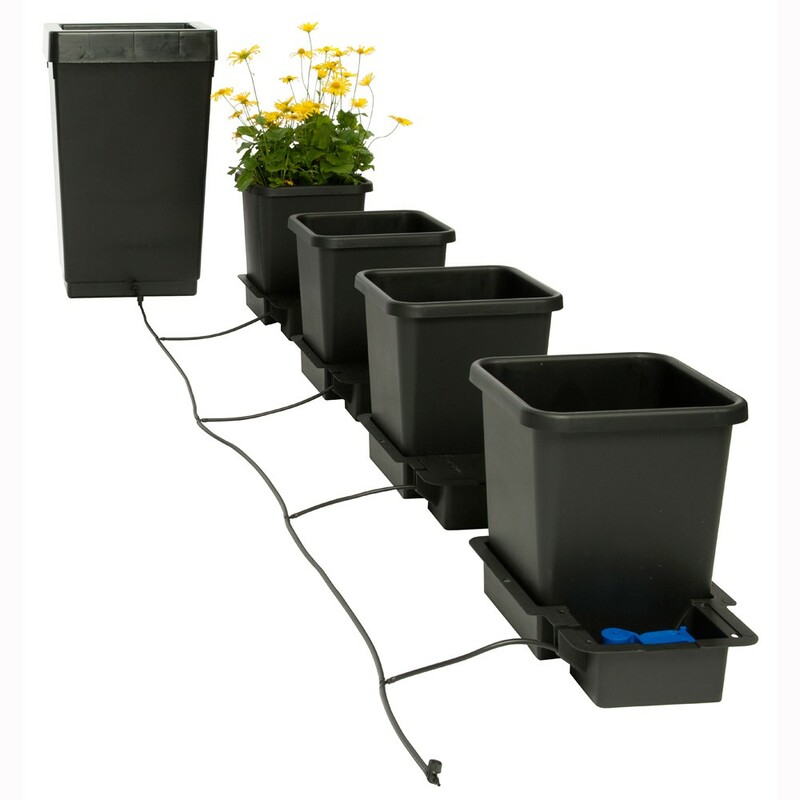 You can transplant a young plant into each of the 4 pots using the growing medium of your choice. We recommend either opting for soil, coco, cellmax cubes or a combination of coco and perlite (50% of each), clay pebbles and coco (60% and 40%) or soil and perlite (50% of each). Still with the pots positioned out of the system, give your plants a light watering. As soon as the pots have drained, place them in the trays. For the time being keep the system turned off and instead hand-feed the plants until they are established. This gives the roots a decent chance to start growing and developing properly, heading down towards the bottom of the pot, where they will access the nutrients and water as soon as you switch on the system. 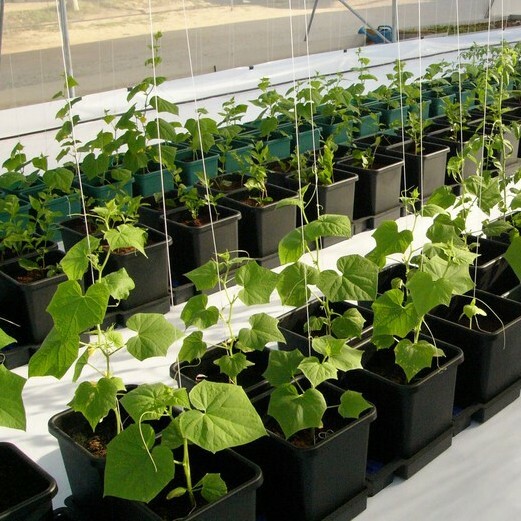 After 10-14 days your plants should be ready to cope with a fully working set up. With a complete system laid out and connected up, and established plants in each of the pots, you can begin to automate feeds by switching it all on. Depending on your choice of growing medium, fill the tank with water or a nutrient solution – stopping just short of the top. Then place the lid on the tank. 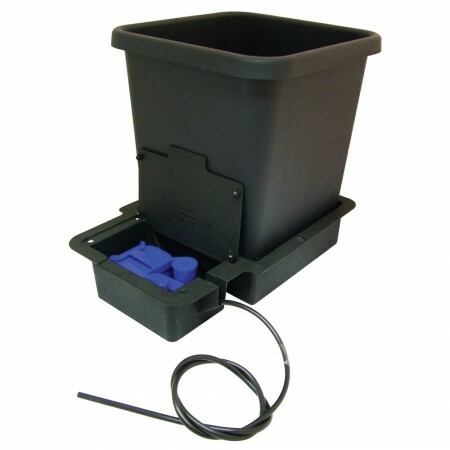 Release the feed for your plants to enjoy by twisting the 6mm In-line Tap nearest to the tank. The AQUAvalves will allow each tray to flood with water and nutrients to a level of 20mm, at which point they cut off the supply until the plants have consumed what is available and require more to be distributed. If you are going to add nutrients and/or stimulants to your system make sure that they are not thick or gloopy – this means avoiding organic feeds and products such as Bloombastic and Plagron Green Sensation. Do not let the tank run out of water and nutrients. As soon as the level goes below 1/3 full, introduce more feed. You will find the valves remain at the highest level of efficiency when the tank is kept topped up. Inspect the trays every other week to make sure that the AQUAvalves are free from loose bits of growing media. 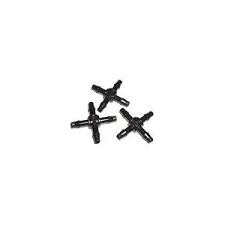 At the end of a crop, wash all of the system components and replace the Root Control Discs. 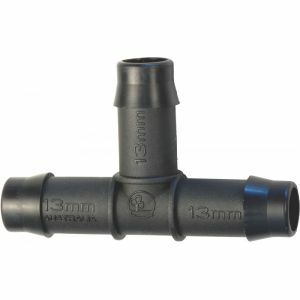 You could also add new lengths of 6mm pipe to guarantee that the system stays clear of blockages. Avoid feeding or flushing from above the pots. 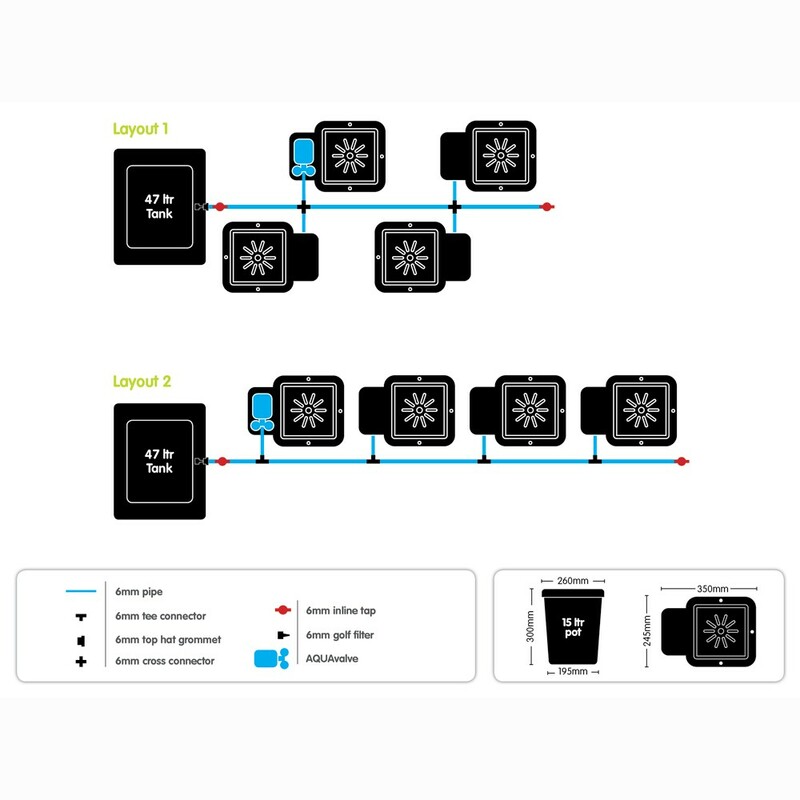 The 6mm In-line Tap at the end of the main line of pipe is designed to allow you to flush the system every couple of weeks, removing the sediments created by the nutrients. Just fill the tank with water and then open the tap to effectively perform this procedure.